Texas Exes Scholarship Application Now Open! The Texas Exes application for Current UT Students and Transfer student scholarships is now open! Our application has opportunities available for current UT undergrads, grad students, or incoming Fall 2019 transfer students. Students must be planning to enroll full-time for the 2019-2020 school year. The deadline is March 1, 2019 at 11:59 PM CST. 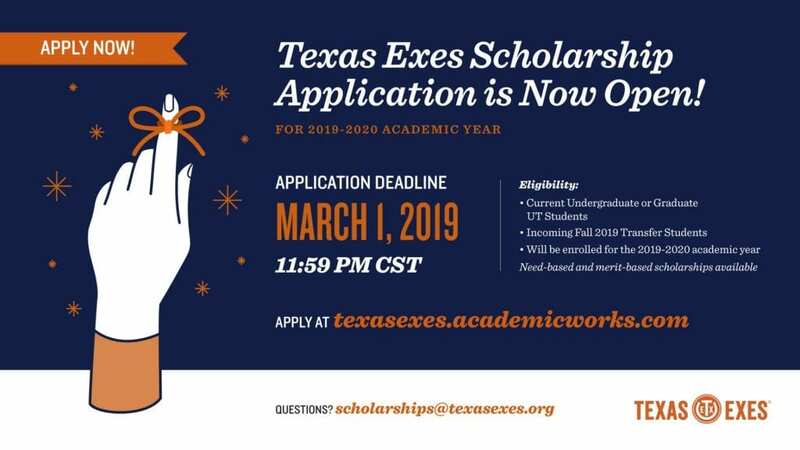 Students can apply by going to texasexes.academicworks.com and click “sign up” or “sign in” in the upper right hand corner! « Applications for the Glenn Maloney Scholarship are now open!